An Oxford University economics lecture about the credit crunch is at the top of a global iTunes chart for education. Earlier this month Oxford and Cambridge began to distribute lectures to students and the public through the iTunes downloading service. 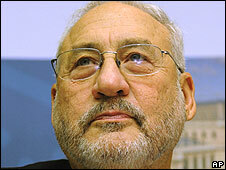 A talk by the Nobel Prize winning economist, Joseph Stiglitz, is the current chart topper in the "iTunes U" service for university lectures. Oxford University has nine entries in this international academic top 30. The talk by Joseph Stiglitz, former vice president of the World Bank, is top of the university podcasts on iTunes, giving an insight into what non-music downloads are appearing in students' music players. Other catchy chart successes in the top 30 are Programming Methodology Lecture One from Stanford University (in at number 10) and the provocatively titled, The World is Flat, from the Massachusetts Institute of Technology (in at number four). Both of these are more popular than Michael Palin's Oxford, which is at number 13 in this intellectual popularity chart. A Steve Jobs lecture at the University of Pennsylvania is at number 14 and Barack Obama as recorded by East Tennessee State University is at 18, without any sign of an alternative offering from his presidential rival. The Open University, which launched an iTunes service earlier this year, has its lecture for Beginners Spanish at number 11 - the second highest placed UK entry. Cambridge University also makes an appearance at number 30, with a talk on the Monarchy. Oxford University launched its iTunes service with plans for 150 hours of video and audio material of lectures and ideas from "world-leading thinkers". It also provides background information about the university for anyone considering applying to be a student. In its first week, the Oxford iTunes service had 60,000 downloads.